Canadian Business and PROFIT today ranked Carbon60 Networks No. 180 on the 28th annual PROFIT 500, the definitive ranking of Canada’s Fastest-Growing Companies. Published in the October issue of Canadian Business and at PROFITguide.com, the PROFIT 500 ranks Canadian businesses by their five-year revenue growth. Carbon60 Networks manages business-critical applications for customers across verticals including financial services, software, media and public sector. 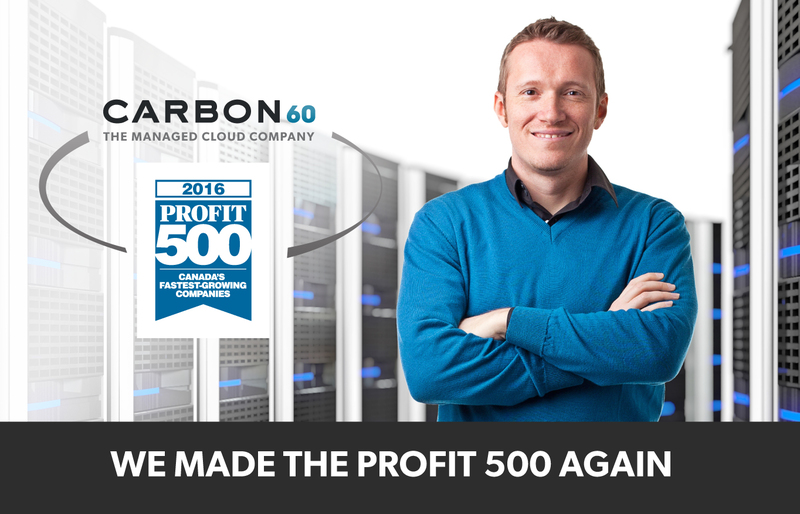 With multiple managed cloud locations in Canada combined with being a Microsoft Azure cloud partner for broader reach, Carbon60 builds and manages secure, reliable and scalable hybrid cloud infrastructure solutions to enable its customers to focus on their core business applications instead of underlying IT infrastructure operations. Carbon60 takes a white-glove approach to customer support and becomes a trusted extension of our customers’ internal IT departments for long-term relationships. Carbon60 Networks specializes in delivering “end-to-end” managed hosting and cloud computing solutions for public and private sector organizations with business-critical IT workloads. Our secure multi-origin cloud hosting platform, comprehensive technical support services and end-to-end service level guarantees make us the trusted choice for companies that need a managed hosting partner to deliver deep application-level support along with world-class reliability, performance and security. Visit us at Our Website / LinkedIn / Twitter.